A 0-70 rated handicap for four-year-olds plus. A pretty poor affair. Five horses take part: all fillies and mares. This isn't a race type I would take any great interest and this post is to detail a humorous story rather than a fill-your-boots tip. The horse in question is Meddling, trained by Julia Feilden. I know one of our regular readers will be rolling his eyes as I mention this individual, trained from Exning, just outside Newmarket. I am an avid reader of Julia's blog, and a superb read it is, too . I remember her excellent horse Spirit Of Sharjah, who competed at Group class at two and had an official rating of 107. What a wonderful specimen. Aged nine, he has since retired and owned by none other than Richard Perham. His name will be familiar to readers because he used to ride professionally for Richard Hannon. 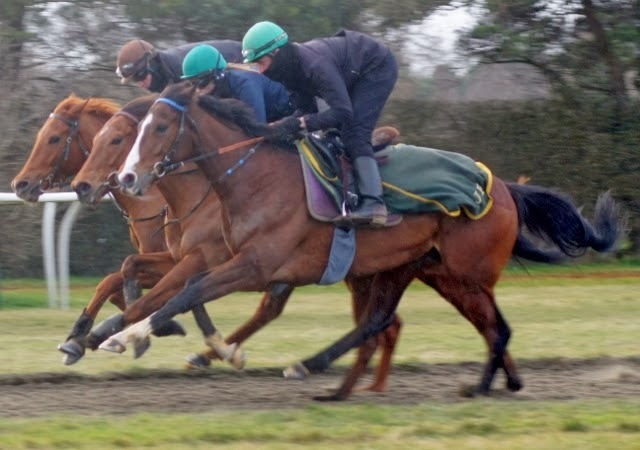 These days Richard works for the British Riding School, coaching fledgling jockeys. In addition, he's a regular presenter on At The Races. It proves that the racing world is small and interwoven. I've been following the progress of Meddling. This daughter of Halling was purchased in December by Feilden for 15,000gns. Now four years old, she's said to be going well at home and the stable fancied her last time at Wolverhampton when a 25/1 shot. By all accounts it was a disappointment, finishing last of seven runners. The interesting part of the story is that this chestnut filly used to be trained by Sir Michael Stoute. Although fancied on a number of occasions, this April foal couldn't find the winner's enclosure. Feilden has decided to step this filly up to 1m 2f in an attempt to find improvement. I imagine this has as much to do with her breeder suggesting a test of stamina could be the key. Evidently, he told this to Sir Michael Stoute. He never got a reply! Most punters have given up the ghost. I assume the stable are testing the water today but a drop in weight, after the trainer said Meddling was well handicapped, could give hope. I would have to take a watching brief and cross my fingers for the Feilden team.